"Spicy sandwich with bacon, avocado and bacon. Excellent for college dorm rooms, small kitchens, rushed cooks." Cook bacon in the microwave on a paper towel-lined microwave safe plate until crispy, about 4 minutes. Meanwhile, stir together tuna, Dijon mustard, horseradish, relish, and red onion. Season with paprika and pepper. Divide this mixture between the hoagie buns. 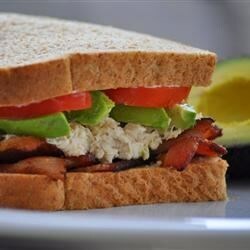 On each sandwich, place 1/2 an avocado, 1/2 a tomato, 1 slice provolone cheese, 1 lettuce leaf, and 2 slices bacon. Added 2 Tbsp of salad dressing to help tuna mixture with dryness - made it more like consistency I am used to. Melted cheese on tuna before adding everything else - Delicious! Loved it. Yummy! It wasn't as good as I thought it would be. But thank you for the recipe. I did forgo the horseradish and pickle but it was easy to make and tasty. My husband loved this I did melt the cheese on top. My husband said one of the best he has ever had. Maybe all of the ingredients should be increased (except the tuna) to give it more flavor . . .